Bob was born July 15, 1941 in Saint Neots, Huntington UK. Bob immigrated to Canada with his family for a new life in 1956. Settling in Thunderbay, Ontario where he started playing drums in a band called “Thunderbay Show Band.” Being recognized for his drumming skills he went on to playing drums for numerous different musicians such as Bobbi Curtolla. This lead to joining a band called the “Missing Links” where they gained more popularity which lead to sold out shows and an opportunity to play their music in the states. Creating their own style and sound, they dyed their hair pink, changed their name to “The Lady bugs” and they were off touring the states. Bob was recognized for his drumming talents and asked to play with many famous musicians during his life long music career. Bob was bigger than life to his family and friends that surrounded him. From a rock n roll star, to a born again Christian, to putting his music aside to raise a family. He moved on to doing his artwork and received numerous awards for his innovative three dimensional glass sculptures. He then moved onto his love for fishing and spent his time doing guided fishing tours. Bob continued to do a variety of jobs, however always going back to music and his artwork. From trucking in the states, to being the first mate on the Wanda Sue, to selling Hoover vacuums, Guatemalan clothing, to so many others, too many to name. 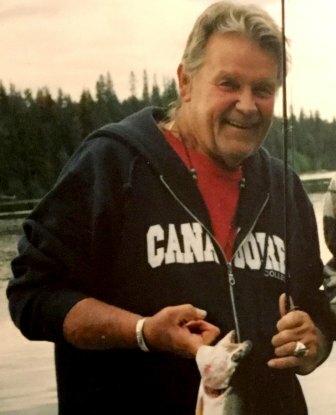 He had the entrepreneurial spirit and innovative ideas and his love for fishing combined with his love for glass lead him to inventing the first fused glass salmon lure. Bob and his daughter, Cari-Anne worked together side by side inventing and creating “Fire Fish” lures. This lure gained major popularity and in 2005 they received a special honour award in the outdoor Canada magazine for their unique contributions to sport fishing. To be recognized as one of the top 10 fishing lure manufacturers in Canada was a proud accomplishment for Bob. Bob enjoyed keeping life exciting, 4x4ing in the jeep, camping and waterskiing to travelling across Canada to owning an arcade. He always had a plan and was not known for sitting in one place for too long. Always keeping life moving and fun. Not just for his family but for everyone in his life. Health issues lead him back to the Interior where they continued to invent and create fishing lures. Anywhere that Bob went people were drawn in to his charming personality and he had many friends in all walks of life. He could sell snow to an Eskimo and make you laugh with his corny jokes. When talking to others he always left you feeling like you belonged. He had a big heart and zest for life. He had an answer for any question, a walking encyclopedia. In his company there was never a dull moment. It is a great loss to all who knew him and he is sadly missed by his seven children, 8 grand-children, 2 great-grandchildren and his many friends. May his music, his jokes and his stories live on through generations. A celebration of life coffee house will be on the 16th of Sept at the Savona Hall, Savona access road. Public affair, bring smiles and instruments, coffee and sandwiches will be served, and lots of great music. It’s apparent his light will shine bright forever. Bob also has two siblings who will miss him dearly. A sister Elaine in Campbell River, BC and a brother Barry in New Brunswick. We had many wonderful jam sessions throughout our lifetime and laughed so hard, we had tears running down our faces. Memories we’ll cherish. When I think of Bob, I’ll always remember him singing our wedding song…”Have I Told You Lately That I Love You”. Well we love you dear brother.